Brent Dutton is a musician of diverse interests and pursuits. He has an amalgam of careers as composer, performer, teacher and arranger. His musical studies began at age nine in his native Canada. He began composing at age ten and attended the Royal Conservatory of Music while still in high school. Prof. Dutton has an extensive list of publications and performances in North America and abroad. He has published over 100 works for a wide array of instruments and ensembles from solo viola to full symphony orchestra. His music has been recorded by Deutsche Grammaphon, The Canadian Broadcasting Corp., Crystal Records, Eroica, LMP, Kanda Records, Good Vibrations Records. PBS and others. He has received over 30 awards for his work including two Yaddo Fellowships, five Canada Council Arts Bursaries, The Phi Kappa Lambda Excellence Award (Oberlin) and the Royal Conservatory Of Music Silver Medal for Excellence. He has four times (1987,1989, 1993, 2002) been named Outstanding Professor of the Year for Music at San Diego State University and in 1985 was named Distinguished Professor of the Year for his College. He was the Phi Beta Kappa Lecturer for SDSU in the Spring of 1993, the same year that he was elected to the Canadian Music Center as Associate Composer. 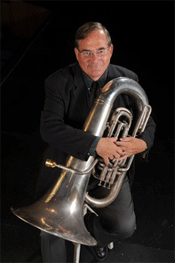 As a performer, he has played as a soloist, chamber musician and orchestral musician on the tuba throughout the world. He has been a member of the Cleveland Orchestra, L’Orchestre Symphonique du Quebec, Grand Ballet Canadien, Jeunesses Musicales World Orchestra, and the San Diego Symphony, The San Diego Brass Consort and Westwind Brass as well as many other professional ensembles. He was the first tubist to ever do a recital tour of Canada. Mr. Dutton has been on the music faculties of the Oberlin Conservatory of Music, the California Institute of the Arts and Central Michigan University. He has been the brass coach for the Jeunesses Musicales World Orchestra from 1986-92 in Poland, Germany, Sweden, Norway, Finland, The Soviet Union, Uruguay, Argentina, Canada and Denmark.